on friday, i will be a free woman. i’ve been working full time as a marketing intern at a start-up. while i’m glad for the money (the last time i got regular paychecks was 2 summers ago when i was working at a soul-sucking retail store) and the new bit i can add to my resume/linkedin, i’m a bit ticked off that i didn’t learn much. besides spamming people to see if they were interested in promoting our product in exchange for free product if enough people bought, along with random odds and ends, i didn’t do much. the other interns were fun to be around, and i loved the office perks (free lunch on mondays + wednesdays, and the receptionist’s impeccable music taste), i didn’t love the work. nor am i interested in the product. my goal for next summer: a marketing internship at an established company (so done with start-ups, i want to work with a real marketing team) in the food industry. hmu, hr departments (not even kidding). 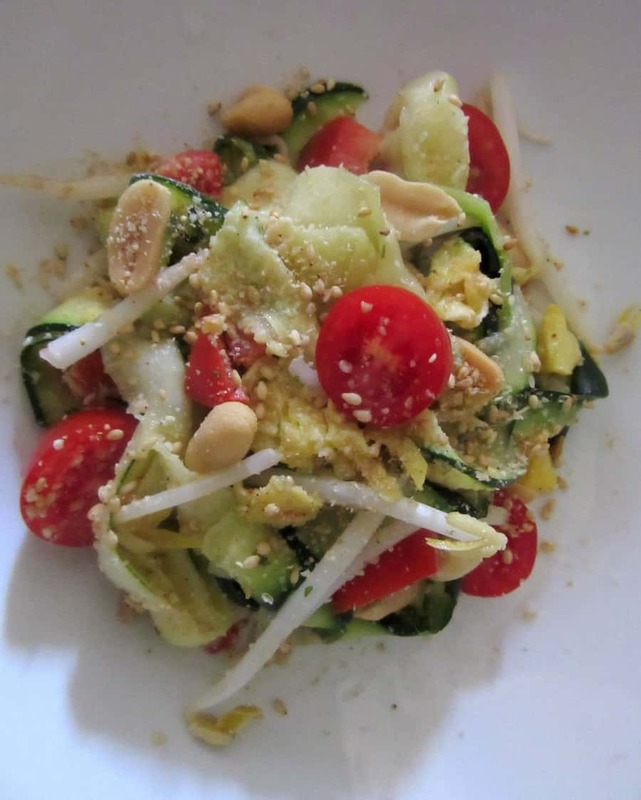 moving on to the vaguely thai zucchini salad portion of this post, whose leftovers are perfect for work (they served as my lunch multiple times during the aforementioned internship). 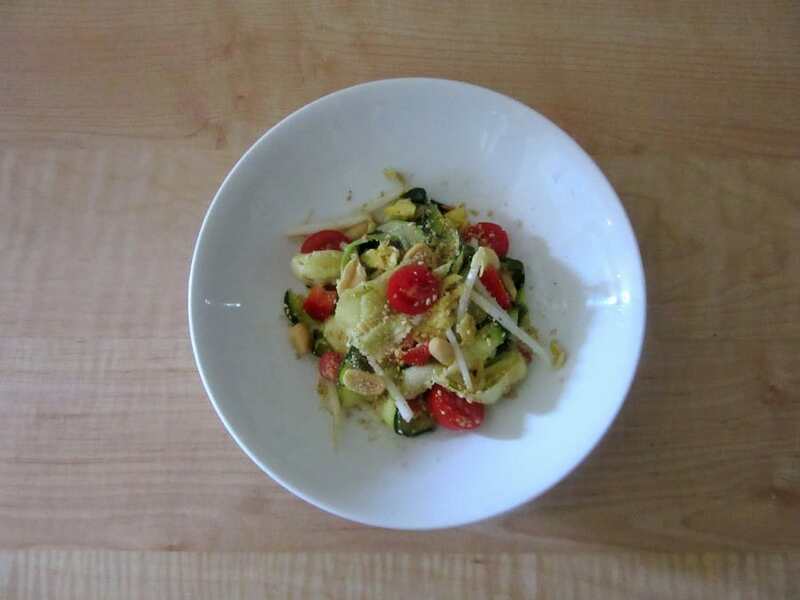 i might be that stereotypical california girl posting about zoodles twice within 4 weeks (see: pesto eggplant zucchini pasta), but darn it, they’re pretty tasty. particularly in this dish. it was supposed to be pad thai-esque, but while the dressing is a little sweet and a little tangy, it doesn’t have the same sweet/sour balance that tamarind brings to the party. my dad was a wee bit confused when i said that this was supposed to be pad thai inspired. hence, a vaguely thai zucchini salad. the dressing is tangy and fresh, but gets a bit of creaminess and heft from the peanut butter (natural crunchy salted all the way, pls). there’s the silky zucchini, crispy bean sprouts and bell peppers, crunchy/toasty/nutty sesame seeds and peanuts, tender tofu and eggs. delicious even if it’s only vaguely thai and there’s too many zoodles up in here. Make sure you drain all the veggies and herbs well; otherwise your salad will be very watery. Mix the dressing ingredients until smooth. In a large skillet over medium heat, heat some oil. Add the zucchini and cook just until a little wilted; it should still be bright green. Remove from heat, and toss everything in a large bowl. “Vaguely Thai” – love it! It’s like I kind of know what to expect, but it’s still kind of a surprise 🙂 Bring on the zoodles! thanks! it doesn’t make sense to me when there’s a salad drowning in dressing or full of fried wonton strips; tasty, but then it’s not that healthy (which to me is the whole point of salad)!